Allison - am not sure how it differs from your work, but if all can put efforts together it would be super! This is great team work!! 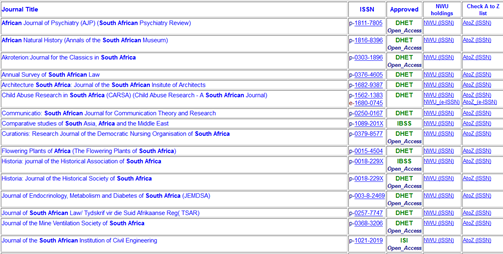 At NWU we compiled a "one stop search" database using the 5 lists of accredited journals acknowledged by the DHET. We also indicated which journals are Open Access (which we do not claim as totally complete),  link to our Ebsco A-Z list where you will find a subject indication and even link to our catalog for holdings control. For 2015 we plan to also add the journal link as well as a subject index for easy searching. Over the past two months at UWC, Jill Claassen (Digital Scholarship Librarian) has been working with the faculty librarians to compile lists of accredited OA journals arranged by subject. This has been seen as a useful resource for busy librarians who cannot keep tabs of all the emerging accredited OA journals in the fields they work with. We divided up the 3 lists of accredited journals (WoS, IBSS and DHET lists), checked the journal sites to be sure that they are pure OA, not hybrid titles and then organised these by faculty and department at UWC. While our departmental breakdown might not match yours, I'm hoping that you can tweak these files to compile a useful online resource for your own institution. We didn't exclude any journals (even veterinary journals, which is not offered at UWC), but incorporated these into the closest disciplinary list. You'll find:  life sciences, physical sciences, community &health sciences, arts, economic and management sciences, education, dentistry and law journals. Each list has live links to journals, indicates when they were started and whether there are article processing charges or not. The lists are very different in size! Since the list is growing each year and has to be checked against the DHET indexes annually, I'm hoping that we can collaborate on such a task next year. Please let me know if I might contact you early next year to help organise the project? PS: Paulette, as LIASA-HELIG secretary, please would you forward this to the HELIG members - much obliged!